“Even successful people sometimes view the desire to get rich as something shameful. Having been taught that we live in a world of finite resources they never achieve the complete success they deserve because they believe it comes at the expense of someone else. 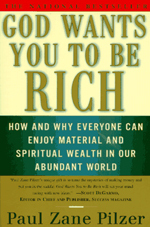 But now Paul Zane Pilzer, the author of Other People’s Money and Unlimited Wealth, explains how and why God wants each of us to be rich, in every possible way–in health, love and peace of mind, as well as material possessions. An individual’s success is good for all of society, argues Pilzer, because wealth begets wealth for everyone. Pilzer exposes the key error–the belief in scarcity–that leads to a misunderstanding of the process of creating wealth. Countering this zero-sum view of economics, Pilzer shows how a society’s wealth is determined not by the supply of physical resources, which are supposedly limited, but by human ingenuity, which constantly redefines what counts as a resource in the first place. Thus, in the nineteenth century, as the supply of whale blubber shrank, humankind found a way to make use of the worthless black goo that oozed out of the ground in Texas and the natural gas that was regarded as a hazard in Pennsylvania coal mines. Today, the most important technology, the microchip, is made out of the world’s most common material–silicon, which is basically sand. So wealth is not limited by physical resources, it is as unlimited as the power of our minds. Our economic system rewards those who make the largest positive impact by fulfilling the wishes and needs of the most people. Their success does not come at someone else’s expense: rather, it contributes to the constantly changing resources that we all draw upon. A theology of economics that explains why God wants each of us to maximize our economic potential, God Wants You to Be Rich also explains howto accomplish this. In insightful and practical chapters, Pilzer shows how readers can take advantage of revolutionary changes in distribution (such as network marketing), what the workplace of the twenty-first century will look like, how to quit before you’re fired in an era of downsizing, how to make your (former) employer your first customer, and what government can and can’t do about our social and economic ills.